Today, 10 August, the Church marks the Feast of St. Lawrence of Rome. Lawrence was one of the seven deacons of Rome. He lived in the third century. Along with his bishop (Pope Sixtus II) he was martyred during a persecution of the Church that took place in Rome during the reign of the Emperor Valerian in AD 258. It is fitting, therefore, that today my local Church, the Diocese of Salt Lake City, laid to rest to a great deacon, Silvio Mayo. Deacon Silvio was ordained with the first class of permanent deacons for our diocese by Bishop Joseph Federal. This first ordination of permanent deacons took place in The Cathedral of the Madeleine on 26 December 1976. Of course, 26 December is the feast of that other great deacon, St. Stephen, who was the Church's first martyr. Somehow, this book-ending seems very fitting for Silvio. Deacon Mayo, I believe, was the first permanent deacon to serve as Diocesan Chancellor of any diocese, at least in the U.S. if not worldwide. He served our diocese as Chancellor for nearly 30 years - from 1984-2013. I had the privilege of serving with him at The Cathedral of the Madeleine from the time of my ordination in 2004 until his retirement in 2013. For the first year or two, given not only our age difference but my relative youth (I was 38 when I was ordained- Silvio was then in his late 70s), we couldn't quite figure each other out. Our relationship for those first few years was cordial. After serving with each other for a few years, however, Silvio and I became good friends and we enjoyed each other's company. We would sit have a cup of coffee in the kitchen of the Cathedral rectory at least once a week. Man, did we joke around and give each other a hard time. To be frank, what we discovered we had in common was that we were both smart alecks. 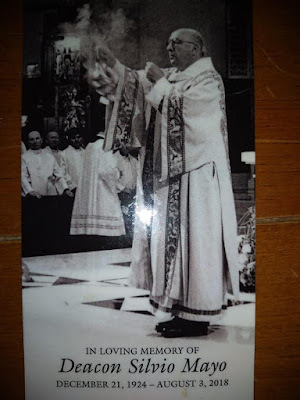 After he retired, when I was still serving at the Cathedral, on a Sunday here or there when I did not have duties at the altar, I would go to Mass with him. I remember one year, 2014 I believe, we were at Mass together on the First Sunday of Lent. Listening to the homily, the homilist mentioned he was giving up coffee for Lent. Silvio looked at me with his mischievous smile and said: "Let's not get carried away." Deacon Silvio's funeral Mass at the Cathedral today was beautiful. This young punk deacon (I am still the youngest permanent deacon in my diocese) was honored to be asked to sit at the screen on the Cathedral chancel and to pray the Intercessions. Silvio was 93 at the time of his passing. Silvio lived a long and fruitful life, a diaconal life, that is, a life of service to others. It bears noting that his son, Monsignor Joseph Mayo, was the Cathedral Rector during our years of service there together. I often felt like I was a member of the Mayo family. Silvio, along with the rest of his diaconate class, laid a firm foundation for the diaconate in our diocese. There are only two members of that class who are still alive, both of whom are no longer in active ministry. Our Chancellor today, George Reade, who is a member of my diaconate class, serves our diocese as Chancellor, continuing what I hope will be long-lasting tradition. Requiscat Silvio in pace. In light of all that it's difficult to pick a Friday traditio. It's good to give this some thought each week. After giving this quite a lot of thought after making my way from Silvio's funeral, our traditio for the Feast of St. Lawrence is Samuel Barber's Agnus Dei. Composed by Barber in 1967, his Agnus Dei composition has its roots in his 1936 composition Adagio for Strings. Sung in B-Flat Minor, Barber's piece is a musical setting for this part of the Mass: Agnus Dei, qui tollis peccata mundi, miserere nobis/Agnus Dei qui tollis peccata mundi, miserere nobis/Agnus Dei, qui tollis peccata mundi, dona nobis pacem - "Lamb of God, you take away the sins of the world, have mercy on us. Lamb of God, you take away the sins of the world, have mercy on us. Lamb of God, you take away the sins of the world, grant us peace." I wish I could have known Deacon Mayo. Thank you for this post.